The Night Owl printed duvet cover is a super convenient, always-ready duvet. 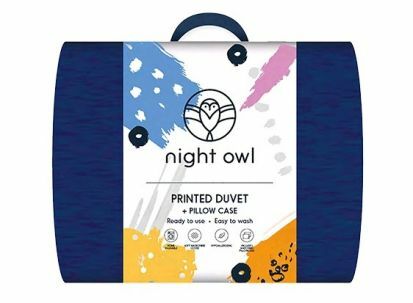 There's no need for a duvet cover - the Night Owl duvet has a soft-touch microfibre cover so it is ready to go to bed whenever you are. Especially useful for guest beds, sleepovers, camping or just snuggling down on the sofa to watch TV or read a book, the whole duvet can be washed and dried in a normal washing machine. And it may be light but it is still nice and warm - a 10.5 tog rating ensures you're nice and cosy whenever you use it. The duvet comes with a matching pillowcase (or two pillowcases in the case of the double), and the duvet can be stored in the pillowcase when not in use, adding to the convenience.